Книга появится в продаже в начале декабря 2018 года — на англ. языке. What goes up, must come down. As any student of financial history knows, the dizzying heights of the stock market can’t continue indefinitely—especially since asset prices have been artificially inflated by investor optimism around the Trump administration, ruinously low interest rates, and the infiltration of behavioral economics into our financial lives. The elites are prepared, but what’s the average investor to do? -How behavioral economists prop up the market: Funds that administer 401(k)s use all kinds of tricks to make you invest more, inflating asset prices to unsustainable levels. -Why digital currencies like Bitcoin and Ethereum are best avoided. -Why passive investing has been overhyped: The average investor has been scolded into passively managed index funds. But active investors will soon have a big advantage. 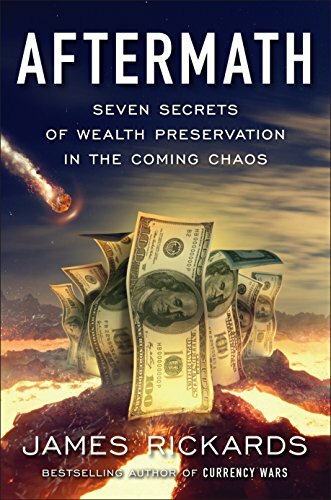 Provocative, stirring, and full of counterintuitive advice, AFTERMATH is the book every smart investor will want to get their hands on—as soon as possible. JAMES RICKARDS is the New York Times bestselling author of The Death of Money and Currency Wars. He is the editor of the newsletter Strategic Intelligence and a member of the advisory board of the Physical Gold Fund. He is an advisor on international economics and financial threats to the Department of Defense and the U.S. intelligence community. He served as a facilitator of the first-ever financial war games conducted by the Pentagon. He lives in Connecticut.